The image gallery was a pleasant surprise - it's the same as the one found in Nokia's N-Series phones and looks great. The speed of photo browsing increases if you press and hold the direction buttons on the D-pad. This allows quick skipping of tons of files if you're not in the habit of sorting out your memory card regularly. Unlike, say, the Nokia N85, zooming here is very speedy, thanks to the zippy 600MHz processor. It does slow down a bit when you get over 100% but it will go up to 400% zoom. Zooming is done in small increments (about 10%) and panning is quite fast too. The gallery offers a nice slide show with customizable effects and delay between slides. You can also choose the direction of the slideshow - forward or backward from the currently selected photo and the track to go with it. Music can also be switched off if you prefer. The gallery also has a very good picture tagging system. In addition to geotagging, which is automatically handled by the camera, you can add as many tags as you like to each photo and then use them as filters. There's also the option to organize photos in Albums. The Nokia 5630 is equipped with a 3 megapixel camera with a maximum image resolution of 2048 x 1536 pixels. It sports a dual-LED flash but no lens protection whatsoever. This means that the glass covering the lens is prone to finger smudges. It doesn't have autofocus, instead it relies on the so called enhanced fixed focus. As far as settings go, the camera on 5630 XpressMusic is limited, although it offers several scene presets, one of which is user defined. There's limited control over light sensitivity (it has low, medium, high and auto settings) as well as some control over sharpness and contrast. On the right side of the screen, there's a bar with shortcuts for some settings. You can add and remove shortcuts so you can have quick access to the settings you need. The rest of the settings include flash control, self-timer (2, 10, 20 seconds), night mode, automatic panorama mode and multi shot. Multi shot captures consecutive images one after another (6 images or - if you hold down the shutter key - until you release the key or the memory runs out). After that you can pick which images to keep. There's also an option to capture consecutive images separated by a predefined interval (from 10 seconds to 30 minutes). Color effects (sepia, negative, black and white, vivid) can also be enabled. The image quality is good overall, with decent levels of detail for a 3MP shooter. There's little noise in well lit areas and the contrast is good. The color rendering is accurate; however the sharpening algorithm gets overzealous, which results in artifacts. The Nokia 5630 XpressMusic is the first Nokia handset to feature the enhanced fixed focus, which was introduced by Nokia at this year's MWC in February. The handsets with enhanced fixed focus are supposed to be able to shoot from closer distance than the regular phones. We tried shooting with the 2 megapixel Nokia 6500 classic just for focus comparison's sake. As it turned out, the technology is not that much of an improvement. Take a look at the comparative test shots. They are both taken form 30 cm distance. Any closer than that and the phones failed to achieve acceptable focus. By the way, the iPhone 3G produces pretty much the same results from this distance, but we are not including it in this test. As for video recording, the camera shoots in VGA resolution at 15 fps captured in MPEG-4 format. Although this is a decent achievement, the quality is quite poor actually. The modest frame-rate takes the fun out of the higher VGA resolution and makes the videos unsuitable for viewing on a larger screen. Finally it comes the time for our studio resolution chart. 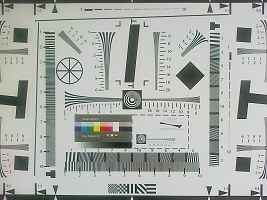 This is a standard ISO12233 chart used for evaluating the synthetic resolution of digital cameras. It is an excellent tool for measuring pure horizontal and vertical resolution and also offers a good reference point for comparison of resolution between cameras. 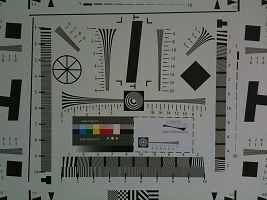 The long parallel lines serve as good measurement of resolved resolution. The point where the lines are no longer clearly separated is where the resolution resolved by the camera maxes out. There's a number scale alongside so you can even set a number corresponding to the camera's performance. The several different line sets are taken from various places across the frame so you also have a nice representation how the image resolution changes as you go towards the edges of the frame (poor optics are far blurry towards the frame ends than in the frame center). We also have some grey and color test charts stuck on there - those show how the noise suppressing algorithm affects the various colors (usually different) and how the algorithm affects the detail in the shadows. 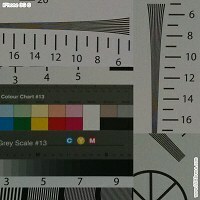 Usually with a poor camera you can't distinguish any difference in the shades of black, while in reality there is some. 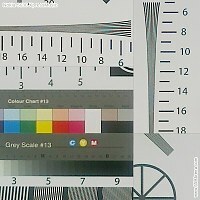 Meanwhile the thin lines at the top of both the color chart and the gray scale illustrate the real-life effect of the noise reduction. You will notice that the numbers are barely readable with some phones and more easily recognizable with others. Here's a comparison of the camera on the 5630 XpressMusic and the one on the iPhone 3GS. They perform about equally, as might be expected (both are 3MP snappers). The iPhone 3GS has a really small edge in resolved resolution. The noise suppression algorithm on the Nokia is too aggressive, resulting in cleaner but more processed-looking photos. Also there's a strange blue fringing visible on the 5630 photos, which is too hinting of imperfect processing.